Egypt’s powerful military warned on Monday it will intervene if the Islamist president doesn’t “meet the people’s demands,” giving him and his opponents two days to reach an agreement in what it called a last chance. Hundreds of thousands of protesters massed for a second day calling on Mohammed Morsi to step down. Military helicopters, some dangling Egyptian flags, swooped over Cairo’s Tahrir Square where many broke into cheers with the army’s announcement, read on state media. The statement seemed to fuel the flow of crowds into city squares around the country where protesters chanted and sang. “Come out, el-Sissi. The people want to topple the regime,” protesters in the Nile Delta city of Mahalla el-Kubra chanted, urging military chief Gen. Abdel-Fattah el-Sissi to intervene. The military’s statement puts enormous pressure on Morsi and his Muslim Brotherhood. So far, the president has vowed he will remain in his position, but the opposition and crowds in the street — who numbered in the millions nationwide on Sunday — have made clear they will accept nothing less than his departure and early presidential elections. That makes action by the generals when the deadline runs out nearly inevitable, since a deal seems unlikely. The statement did not define the “people’s demands.” But it strongly suggested that Sunday’s gigantic rallies expressed the desire of Egyptians. 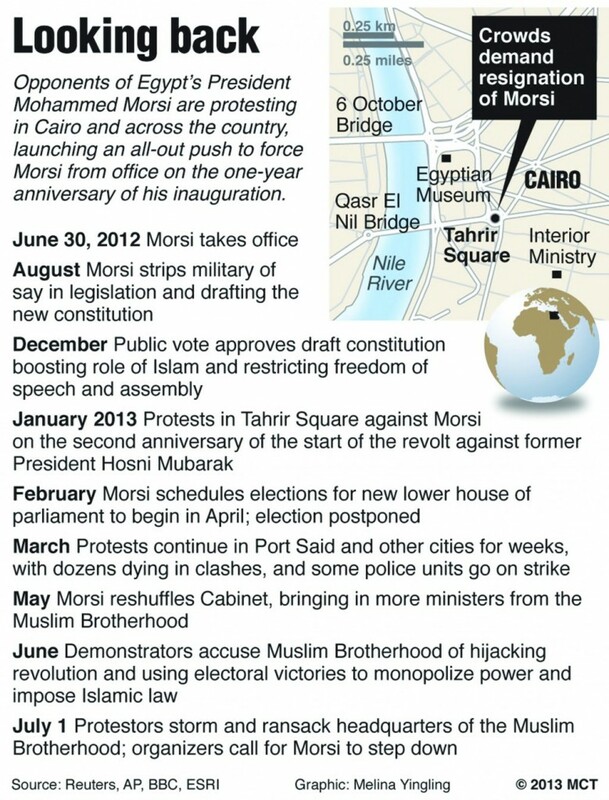 An army move against Morsi risks a backlash from his Islamist supporters, who include hard-line former terrorists. Morsi met Monday with el-Sissi and Prime Minister Hesham Kandil, according to an online posting by the president’s office, without giving further details. In the evening, the pro-president rally outside the Rabia al-Adawiya Mosque not far from the Ittihadiya palace also swelled, though it was eclipsed by the opposition rallies. Its participants blew whistles and waved banners with Morsi’s picture on it. In a sign of Morsi’s growing isolation, five Cabinet ministers said on Monday they have resigned their posts to join the protest movement, the state news agency said. The five are the ministers of communications, legal affairs, environment, tourism and water utilities, MENA reported. The governor of the strategic province of Ismailia on the Suez Canal, Hassan el-Rifaai, also quit Monday, saying he made the decision in the interest of the nation. Monday’s statement was the military’s second ultimatum. Earlier, el-Sissi gave the two sides a week to reach an agreement. That ultimatum expired on Sunday, with Morsi repeating his longstanding offer for dialogue, which the opposition rejected. Sunday’s protests were the largest seen in Egypt in the almost 2 1/2 years of turmoil since the ouster of autocrat Hosni Mubarak in February 2011. Millions packed Cairo’s Tahrir Square, the streets outside the Ittihadiya presidential palace and main squares in cities around the country on the anniversary of Morsi’s inauguration. The main rallies in Cairo were largely peaceful, but deadly violence broke out in several parts of the country, often when marchers came under gunfire, apparently from Islamists. At least 16 people were killed and more than 780 injured, Health Ministry spokesman Yehya Moussa told state media. 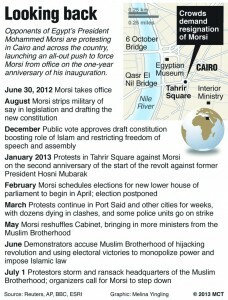 In Cairo, protesters Sunday night attacked the Brotherhood’s main headquarters, pelting it with stones and firebombs. Brotherhood backers barricaded inside opened fire on them in clashes that went on for hours and left eight dead. In the early hours Monday, protesters breached the walls of the six-story luxury villa and stormed inside. They carted off furniture, files, rugs, blankets, air conditioning units and portraits of Morsi, according to an AP journalist at the scene. One protester emerged with a pistol and handed it over to a policeman. Footage on local media networks showed smashed windows, blackened walls and smoke billowing out of the fortified villa in the Muqattam district in eastern Cairo. A fire was still raging on one floor hours after the building was stormed. One protester tore down the Muslim Brotherhood sign from the building’s front wall, while another hoisted Egypt’s red, black and white flag out an upper-story window and waved it in the air in triumph. Morsi’s critics view the Brotherhood headquarters as the seat of real power in Egypt, consistently claiming that the Islamist group’s spiritual leader, Mohammed Badie and his powerful deputy, Khairat el-Shater, actually call the shots behind Morsi. Morsi and Brotherhood officials have denied this and say they have tried to give opponents a greater voice, only to be spurned. 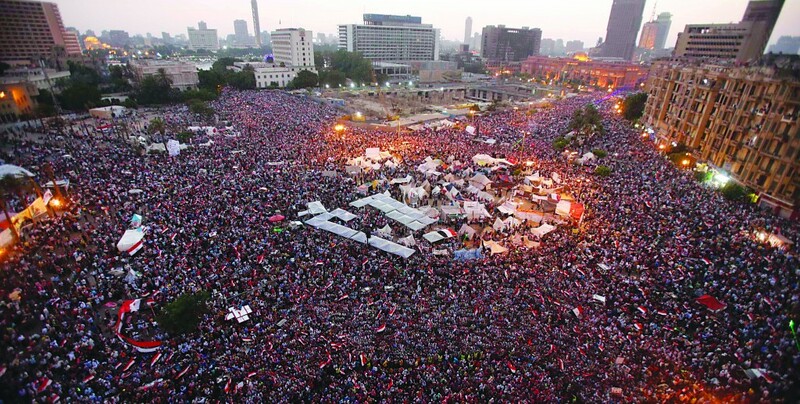 On Monday, the anti-Morsi brought their rallies into a second day. Some protesters spent the night in dozens of tents pitched in the capital’s central Tahrir Square and in front of the president’s Ittihadiya Palace. The anti-Morsi demonstrators are calling for widespread labor strikes in an attempt to ratchet up the pressure on the president, but it was not immediately clear whether unions would respond to the call. Organizers are also calling for sit-ins at the Cabinet building, interim parliament, and another presidential place where Morsi has been working since late last week instead of Ittihadiya. This article appeared in print on page 1 of the July 2nd, 2013 edition of Hamodia.